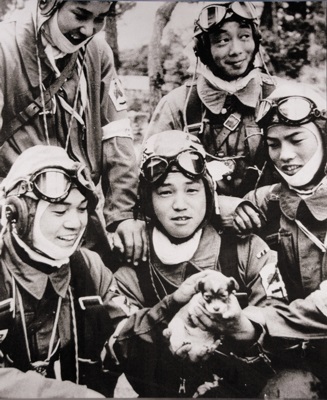 Young Japanese kamikaze pilots photographed the day before their mission. The Japanese command had, in general terms, correctly anticipated the general thrust of Allied plans. They believed that they could inflict very heavy casualties on the invaders, and thus ultimately force the Allies to accept a negotiated armistice, rather than having to surrender. They expected to have around 10,000 aircraft available, and planned to use almost all of these as kamikaze (suicide) planes. During the Battle of Okinawa, 2,000 Japanese kamikaze aircraft had achieved a hite rate of approximately one in nine, but during Operation Olympic, they hoped to achieve one in six hits, by overwhelming US defenses with the sheer weight of numbers. In total, they hoped to sink 400 or more Allied ships, and furthermore planned to concentrate on transports and thus maximize Allied casualties. The Imperial Japanese Navy still a number of large surface units, including 6 aircraft carriers, 4 cruisers and 1 battleship, but there was insufficient fuel available for these. However, the Japanese had prepared many hundreds of midget submarines, manned torpedos and suicide boats, and hoped to use these to inflict heavy casualties on the Allies. Previously experience had taught the Japanese that digging in on the beaches simply exposed their forces to Allied naval gunnery. On the other hand, they did not wish to allow the Americans to be able to establish a secure beachhead without engaging Japanese landing forces. The Japanese therefore positioned somewhat inland (to escape naval gunnery), with counteroffensive forces behind them. In total, the Japanese Army had around 900,000 men, including 3 tank brigades, defending Kyushu. The Japanese organized their civilians, including all healthy men (15 to 60) and women (17 to 40) into a fighting corps. Equipment was severely lacking, much of this force was equipment with spears, bows, or muskets, but they were nevertheless ordered to fight. Allied intelligence was not unaware of the Japanese defensive preparations. Even though intelligence tended to underestimate Japanese strength (for example the number of Japanese ground forces on Kyushu), some senior Allied figures (including General George Marshall) began to become increasingly concerned about the likely casualties. A number of alternatives were considered including invading elsewhere where Japanese defenses were lighter, or cancelling Operation Olympic and proceeding directly with Operation Coronet. General Douglas MacArthur however continued to argue that no changes were necessary.